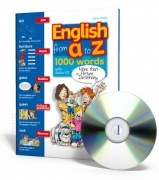 Short Articles for Reading Comprehension 1 + CD Audio Short Articles for Reading Comprehension is a three-level reading course intended for upper-intermediate to advanced students learning to read English. The non-fiction passages found throughout this series present students with a wide range of informative articles that will help transition...more..
Short Articles for Reading Comprehension 2 + CD Audio Short Articles for Reading Comprehension is a three-level reading course intended for upper-intermediate to advanced students learning to read English. The non-fiction passages found throughout this series present students with a wide range of informative articles that will help transition...more..
Short Articles for Reading Comprehension 3 + CD Audio Short Articles for Reading Comprehension is a three-level reading course intended for upper-intermediate to advanced students learning to read English. The non-fiction passages found throughout this series present students with a wide range of informative articles that will help transition...more..